Despite her petite size, everything else about Darlene is big; her smile, her laugh, and her flashy/trashy taste in clothes. She favors leather and pleather jackets, revealing tops, tight pants and high heels, either pumps or ankle boots. She also never goes anywhere without an oversized purse and a pair of sunglasses, typically perched on top of her head. As comfortable as she is in these outrageous outfits, at least part of her appearance is an act; she knows people tend to underestimate a 'blonde bimbo'. Very extraverted ever since she was small, Darlene has become a bit more reflective since recovering from her coma; sure, she can still turn on the charm and Southern sass when she wants to, and she's still a lot of fun at a bar or party, but now there's a somber undertone beneath her oversized persona. Dar has seen the darkness people are capable of, the suffering of those at the brink of death, and what returning from death can do to a Night Breed; now her compassion for others burns as bright as her quest for justice. A pint-sized Southern dynamo in three-inch heels, Darlene Lampwick was a party girl waitress until her big sister Louise, sick and tired of her devil-may-care lifestyle, encouraged her to try to make something of herself. So Dar enrolled in the paralegal program at Athens Technical College; after graduation, no one was more shocked than Darlene when she found out she was actually good at her new job. Things seemed to be looking up for the feisty young woman. But then three years ago, she was sexually harassed by Charles Raymond, a senior partner at the Atlanta law firm where she worked. When she complained, her concerns were dismissed; enraged, she did a little digging into his background, and came upon some very dirty secrets, secrets someone was willing to go to great lengths to keep hidden. Motivation: Justice. Darlene is sick and tired of seeing powerful people get away with murder, sometimes literally. She’s no killer, but her thirst for justice can take her down some fairly dark paths. "Ah’m with the band.”: Even though her life has changed in so many ways, Darlene’s fashion sense has not; she still dresses like a groupie hanging around backstage at a Van Halen cover band concert, which is not always appropriate. “Ah missed some stuff.”: Three years out of your life is like ten years in pop culture reference years; Darlene has a very full TiVo and a lot of catching up to do. "You ain't stickin' me in no damn box! ": Her harrowing experience has left Darlene with fairly acute claustrophobia; among other things, she will now only drive a convertible. Last edited by Heritage367 on Tue Jan 21, 2014 12:55 am, edited 18 times in total. Thought it might be nice to have all the current submissions in one handy list. Last edited by Anomalocaris on Tue Dec 31, 2013 7:54 am, edited 2 times in total. A very nice and eclectic group of submissions so far! I like it. EDIT: Made a few minor tweaks to Darlene's sheet; I forgot to add her Enemy! Since Edward has Comprehend 2(spirits), does that mean he can see them or would I need to have another power to do that? The book seems to indicate that he sees something, but seeing spirits seems like it steps on the toes of super senses. mrdent12 wrote: Since Edward has Comprehend 2(spirits), does that mean he can see them or would I need to have another power to do that? The book seems to indicate that he sees something, but seeing spirits seems like it steps on the toes of super senses. I would have to say if the spirits have any sort of concealment, then you'd need super-senses. OK, so I took inspiration from Cthulhu, Venom, and some.. 'Anime'..
Design notes after the sheet. 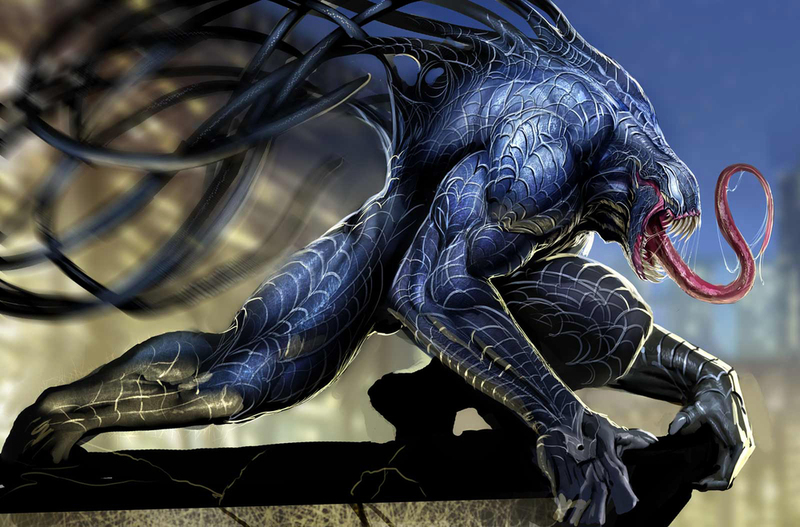 Imagine Venom(Spiderman symbiote) without the 'spider' symbol on his chest (Though he does have magical sigils engraved on his forehead and over his heart), ALWAYS has 13 tentacles waving around, and appearance is permanent. Illusory Whispers: DC 18 Insight, 250 cubic feet of whispering. Apperance: Eli is about as freaky as nightbreeds get. Tentacles: Eli's tentacles seem to have a mind of their own, writhing around and reaching out when he's not controlling them. This can be especially troublesome when there are pretty girls around, as they seem to attract the tentacles attention. I've Seen the Other Side: Eli has glimpsed unspeakable horrors, and may still be occasionaly seeing them. He also occasionally has nightmares. Unsettled Animals: Eli's unnatural form sets animals off - they avoid or growl at him. Destitute: Eli lost everything before his transformation, and holding down a job with his deformities is next to impossible, so he is dependant on the clinic and his fellow nightbreed. Secret: Eli's true past is a secret - though whether this is his choice or something more sinister is unknown to most.. perhaps he doesn't fully remember due to the mental trauma. Perhaps he is afraid to say anymore about the organization he once worked for.. or perhaps something else, something more abominable, is responsible for his reluctance. The man was found by the Clinic nearly dead after a horrible fire at a research laboratory. It's unclear what "Eli"s real name is, as nobody by that name was working there, and the bodies found that night were unidentifiable.. even their DNA had been corrupted, his included. All that is known about him from before the fire is what he was willing to share. When he was first asked his name, he looked off to the side, staring at a painting on a wall for a minute while the question was repeated, before giving a single snicker and shaking his head "You're right, it's only fitting. I've been reborn in fire, call me Eli Henderson." Eli had been part of a large, clandestinely funded group of researchers working on finding more about the Nightbreeds - what caused them, and how to duplicate or undo it. Eli's particular area of research had drawn him down a far different path to the others, a path that led to far realms, other dimensions, and mythical beings. Eli had discovered the Fae and 'true undead' that had returned, and decided to look into other dimensions for an answer. For weeks leading up to the incident, he had been plagued by mysterious accidents and freak occurences, almost as if something had been 'out to get him'. The night of the Fire, he had been close to breaking through into another dimension, but then things started going wrong all at once.. Lightning began striking around the building in waves, equipment within the lab began acting up, the lights started to flicker, A huge wind slammed a tree through a window... and then people started screaming as flames began licking at everything. By the time he gets to this point in the story, Eli usually says he can't remember any more, and resists speaking about it any more.. his tentacles growing increasingly agitated if he is pushed. Eli generaly puts forward a positive mood, trying to move on from the horrible physical and psychological traumas he's received. He wants to continue researching Magic, and ways to help his fellow Nightbreed. Eli has made vague references to a brother, and sometimes reminisces about 'my cat', though wether it is an actual cat, or a womans name, or just a figment of his psyche is unknown, and when questioned about it, he reacts as though he didn't say anything. First, I haven't spent all of his points so I can more easily make any required changes after the character is looked over. Anything not needed will most likely just be put into extra skill points. Senses: his transformation has given Eli enhanced senses of smell, taste, and touch. Uncontrollable is supposed to represent that he can't CHOOSE to allow some people in. How it works: anybody directly affecting his mind (Telepathy, mind reading, mental control, mental illusions, etc) Realizes there's something wrong in there immediately, and may choose to not go ahead with the offending action, doing something else instead. If they DO choose to go ahead, they are affected by a DC 18 will save vs Dazed/Stunned. The illusion is sound limited only to whispers, so he can't use it to shout, imitate other noises, etc. The Side Effect means that everytime he uses it the GM gains a free complication he can use against Eli. Luck swings wildly in both directions for Eli. The senses and Unearthly knowledge are both Uncontrollable, but the sigil 'removes' this flaw (Paying the difference I would have paid without the flaw). Essentially while he has the sigil drawn, they are regular powers, but they become uncontrolled if the sigil is erased/removed. The Comp: Spirits is Extradimensional entities, not ghosts, etc. Postcognition: I know a lot of GM's aren't fond of post/precognition, but figured I'd try for it b/c it makes sense for someone who sees things to be able to 'know' what happened somewhere in the past. Sigils: As mentioned to GM in PM, the sigils are a variant Removable : Not exactly devices, but can be removed under the same circumstances (Defenseless & Stunned, out of combat) by essentially erasing/damaging them, and require the same effort/time to 'recreate'. Eli has 13 major tentacles (as well as several smaller tendrils that writhe about). With some concentration he can control them (Will DC 15), the better he does on his will check the more of them he can control. With his Will save, he needs to roll a 6 to control 1, and 18 to control them all. Those he isn't actively controlling are 'uncontrolled' (As the drawback). They generally don't act against him, though can occasionally cause problems, and sometimes they even help him 'of their own accord'. Elongation, Enhanced Strength, Enhanced Advantages: All of these powers are limited to his tentacles, meaning he can only use them when he's in control of tentacles, but the uncontrolled tentacles ALSO have control of these powers. Movement modes: I chose '4 tentacles' for the limit b/c that made sense for how many he'd need to do those movement modes, while also needing a 9 roll (Close to the Unreliable 10 roll) on the tentacle check. Okay, open recruiting is over. Now I'll start going over the builds to pick my cast. Thanks everyone who pitched a character. I'm looking forward to this game and I hope I do your creativity justice. This may take me a few days to get sorted out and I might request further info on characters or clarifications on design if I'm unsure of an effect. I may not though, so don't get jittery if I don't address your submission. Sometimes it's good to obsessive. Comprehend spirits has been bothering me due to the vagueness of the power description, so if it makes sense for the game(if it matters at this point) would it be alright to replace Comprehend 2(spirits) with Deadmans Senses 4 (Vision Counters Invisibility, Auditory Counters Spiritual Concealment), Dimensional, Limited to Spirits/Astral Entities and still be able to speak with them provided they understand English? I hate to do this, as this seems like it's going to be a great campaign, but I think I'm going to have to withdraw my submission. There are some changes coming in my life this year, and I can't in good conscience commit to something I that may not be able to afford the energy and time it deserves. Thanks for considering me as a player. Have a great game, everyone! Sorry to see you go, was curious to see Persephone in play. Sorry to see you go, too, Ano.